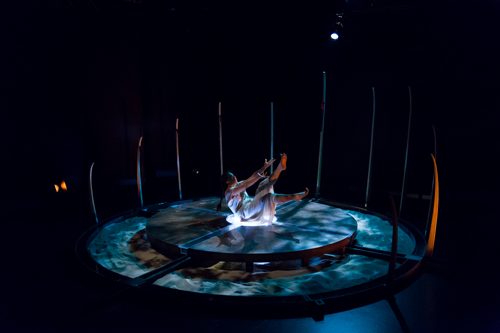 Finding Wolastoq Voice is Indigenous artist and playwright Samaqani Cocahq (Natalie Sappier)’s debut work. The show’s tour makes a stop in Toronto from March 29-31, 2018 as part of the Indigenous Dance Showcase. 1. Can you talk a bit about Finding Wolastoq Voice, what inspired the piece, and what the title means? I have always been an open book. Sharing my experiences and stories. I have realized I always had a fight in me. That even though I would fall at times I was eager to get back up. Throughout the past years I have traveled around the communities of my brothers and sisters and I realized that they were having many of the same struggles I had and continue to have. Trying to find their way, their happiness, their voice. The connection to the land and water was within them, and is important to them and the biggest fear was for them to lose that. I have the same fear. Its been a journey to understand the medicine I have within me–The Storyteller. I believe we all have medicine within us and I wanted to share a story of a young Indigenous woman who goes on a journey of unraveling the stories of her past to find the teachings that lie within them. Wolastoq means River. Saint John River is the name on the Map of New Brunswick. Wolastoqiyik means people of the beautiful bountiful River. I continue to say include Bountiful in the name to remind us that is was once filled with Salmon. We are the people who gathered by the beautiful river. Our communities trail along that river, Wolastoq. For so long we have been quiet. For so long our dances have been quiet and our songs. But many of them are being awakened by our teachers in our communities. Our language is being spoken more. Our stories are being told. The Wolastoq is awake and we are awake with it. That is where the title stems from. 2. Can you talk about your own journey in bringing this piece to life? Every part of the development of Finding Wolastoq Voice has been inspiring me. This creative process was very new to me. I was not confident in my writing so I would comfortably go into sharing stories through music and painting to find the word I wanted to express. I am a visual artists, my language was mostly spoken through imagery. I am not a reference painting, so the memory of the imagery I wanted to paint would come from chanting. So I would chant, to travel to see the imagery, I would paint them imagery to find the words. By the end of my first draft, I had a body of music and paintings to go along with the story. It was the most elevated process I have ever experienced and now I feel I don’t want to do anything else but create stories in this way. Aside from that, to see such amazing creative team Thom Morgan Jones, Aria Evans, Andy Moro and Mike Doherty bring to life the entire play during rehearsal was emotional for me. I was just to honoured to have such a talented artists working to bring to life this very important work. Their spirits and hearts were in development of this piece from the beginning and that brought so much magic to Finding Wolastoq Voice. They created a world beyond my imagination. Their was an immediate feeling of family so handing over the script, music and imagery was not scary but more exciting! Just eager to see what they would come up with. And they never once disappointed. I am very proud of the work they did to make this play. 3. Thinking of an ideal performance, what would you like the audience to come away with? I would hope they leave inspired and curious of the gifts they carry within themselves. I hope that if they are struggling with anything that this will help them become stronger to conquer whatever they maybe struggling with–even just a little bit. 4. Finally, can you talk about your visual arts background and how/if that influences this piece? Painting came into my life at a time I needed healing. It allowed me to express myself when I was unable to find the words-or let go. When I started painting is when I started learning more of myself as an Indigenous being. I began learning about the medicines, ceremonies, language and songs. I painted so much I couldn’t stop. One day I looked around and I couldn’t see myself in anything. So I began painting larger, doing more public works. I needed to remind myself who I was, I needed to see myself in my surroundings and I believe many of my people needed that to. My work started trailing on to the walls of many friends and families and communities. Through clothing, murals, buildings etc. Someone asked me..What gallery would you love to exhibit in? I answered…To walk into a home in my community and see a painting of my work on my wall is what keeps the stories awake within me to create, paint, sing and share. I don’t create work and think of the market of selling it. I create work because I have to. It’s either healing for me or the helping of healing for someone else. But I feel that our stories need to be louder then a painting can speak. We need to hear the language, the voice, the chants and feel the movement within us, the dance. I need that. So I became drawn sharing more stories in that way. Through theatre and performance work. Finding Wolastoq Voice carries many stories of paintings I have created.